My introduction to Habit 5 of 7 Habits of Highly Effective People happened without me realizing. When I was young I was taught to not speak when someone else was speaking… unfortunately I didn’t realize I was also supposed to listen. When I entered the professional workforce my mother gave me a piece of advice. She said, “keep your ears open.” Mom was correctly identifying that my best chances of making an intelligent contribution (and my boss happy he hired me), was if I strived ‘First To Understand‘ before I offered an opinion. Since then Moms’ advice has continued to serve me well. When I became a student of Performance Management, I noticed Mom’s advice turned up in most books and lectures – although expressed differently. Stephen R. Covey refers to the idea of Empathic Listening many times throughout 7 Habits of Highly Effective People, he addresses it specifically in Habit 5 as ‘Seek First To Understand, Then To Be Understood’. 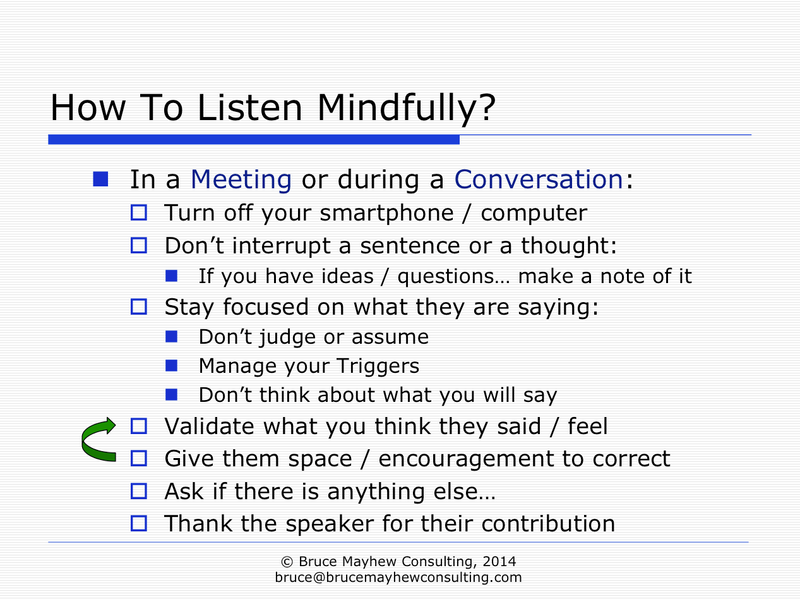 It’s not surprising when I became a student of Mindfulness I quickly saw the connection to Stephen R. Coveys work since Empathic Listening is similar to Mindful Listening. I now believe this empowering pair of Performance Management and Mindfulness make a great – supportive partnership. 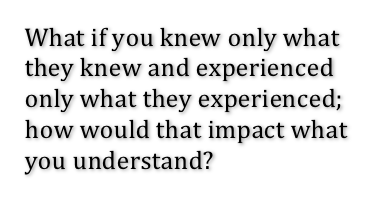 Empathic listening means we turn off our filter of ‘How is that going to affect me/my team/my goals’. Empathic listening means we listen FIRST with an open, respectful mindset of ‘let me try to understand this persons’ needs, goals, pressures and feelings’. Empathic Listening focuses on the speaker, building trust and seeking to understand because where trust and understanding exists, people will openly – actively look for opportunities to help you. If you think about how you’ll respond while someone is speaking, you are not practicing Empathic Listening or Mindful Listening. Don’t confuse Empathic Listening and Mindful Listening with reflective listening or mimicking. Empathic Listening and Mindful Listening are much more involved. These response types do not use empathy. The following demonstrates a positive approach to empathic listening; a very similar approach I learned when I began studying Mindfulness. It requires we use empathy to focus on what someone is saying, AND how someone is feeling. Notice the Store Manager kept exploring the customers feelings. The important learning from this example is that by exploring feelings the people we speak with have opportunity to correct our incorrect assumptions and add clarity to what they’ve said. This process also helps the person you’re speaking with explore his or her own thoughts and feelings. Sometimes they can even resolve their own challenges… or at least be calmer and more open to consider multiple options. In this short example two important things have already happened. The customer has gone from hate and frustration to less volatile feelings of concern and worry. This means they are likely becoming easier to interact with. Everyone realizes the biggest challenge isn’t the wait times; it’s the need for places to sit. Without knowledge, the solution was to add more staff – which may still not eliminate all wait times. With knowledge, the Win/Win solution is to purchase a few chairs – it’s quick, inexpensive and long-term. Before becoming a corporate trainer focusing on individual and team effectiveness I worked for Scotiabank in Corporate Marketing and helped Product Managers develop and market product enhancements. We would spend time with clients and the Corporate Sales teams to identify both client needs/priorities as well as evaluate how to best market these products / enhancements. We had to understand needs before we designed and implemented product enhancements sales training and sales resources. We diagnosed before we prescribed solutions. Stephen provides a very good example of Diagnose Before You Prescribe in 7 Habits Of Highly Effective People. A patient needs glasses so his optometrist gives the patient his own glasses because they work so well for him. Unfortunately, they make it worse for the patient and the patient politely tells him so. The optometrist responds by saying the patient was ungrateful because he knows the glasses work perfectly. Clearly the doctor didn’t try to diagnose before he prescribed a solution and was using a one-size-fits all approach. The doctor failed to ‘Understand’. Some people say empathy at work takes too much time. It does take time, but the most efficient thing you can do is to be in the present moment and be patient. Consider all of the days, money and resources wasted when we don’t seek first to understand. During a day there would be lots of people seen but few provided appropriate care. These patients would either come back to that doctor or be escalated to a hospital… wasting time and money for everyone including the doctor. Different people will see the same challenge differently… and this is a good thing. I might be creative – you analytical. Many of our values may also be different. By being patient with each other we can explore a richness to find a Win/Win solution. The empathic listener can actually get to the important needs / objectives quickly so that the focus is on the Important Work / Quadrant II Work. When you truly focus on understanding someone’s needs and feelings, it becomes easier to calmly find intersections with your own goals / objectives where you can focus on your circle of influence and work toward a mutually beneficial WIN/WIN solution. Ultimately – people want to be understood so I encourage you practice your listening skills.